Hello lovelies! Today's post is featuring LOVELYSHOES.NET. Last time, I ordered something sporty and so casual which I already posted here and here. 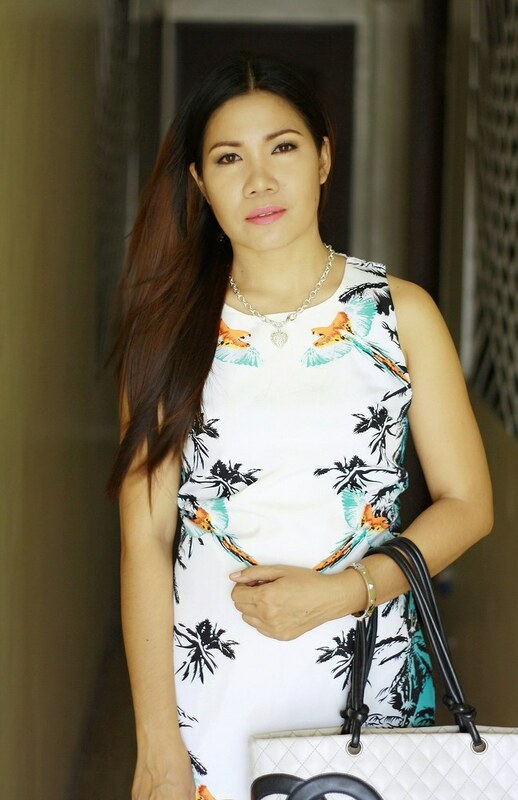 This time I got this printed sleeveless dress, rivet high heel shoes and this saucy elegant dress for a more feminine and lady-like outfit. As I have said before, do not be fooled by the store's name because they do also carry women clothing, lady bags, fashion accessories, occasion dresses, etc. I suggest you take a look of this website now. I love the simple print of this dress because it perfectly fit the summer vibe. A palm trees and some birds were printed, so it is a breeze in the eyes. This dress is so light-weight and kind of slick but not thin to worry about. There's a lining inside and it is sewn perfectly. It was the rivet that made me ordered these high heels. I am a fan of anything pointed. Lol! So, may it decorated with studs, rivets or anything that means a point, I will love it. Seriously, these high heels scream sophistication and sexiness. If you're a regular reader of my blog, you may have noticed that I always wear these heels. It just proves how I love this pair. I'm in love witht the shoes!!! Lovely shoes is my fav online shop, such pretty shoes and very affortable too..
That dress looks so gorgeous, love the shoes too ! Nice dress, we have got it too! Love that summer vibe in your dress Ate Jen!!! I like the print of your dress!